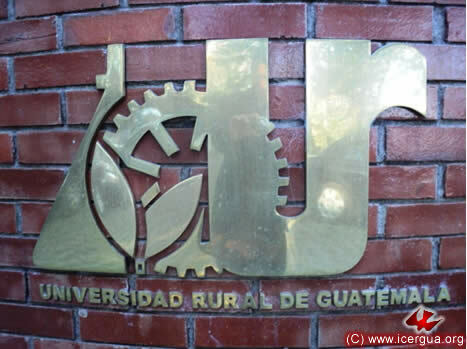 On Thursday, February 3, after several years of dialogue, the agreement was finally signed between the Universidad Rural and ICERGUA, according to which our Center of Studies (CECESAM) has become the SCHOOL OF THEOLOGY AND RELIGIOUS STUDIES of the Universidad Rural of Guatemala. Beginning immediately, the studies that our seminarians are taking have university recognition. When the program is fully operational, our candidates, before receiving holy orders, will have received the following academic degrees: Bachelor of Arts in Religious Studies; Licensure in Theology and Master of Pastoral Theology. The possibility exists of developing other specializations in the future. ESTYMLA, our education facility in Huehuetenango, has now become the Department of Theology and Ministerial Education for the People of God. When its students complete their training, they will receive a diploma of participation endorsed by the University. Above: The dialogue that was established between the Rector of the University, Dr. Fidel Reyes Lee, and the Dean of the Faculty of Law and Legal Counsel, Lic. Mario García, with our bishop and members of the seminary faculty and some students. 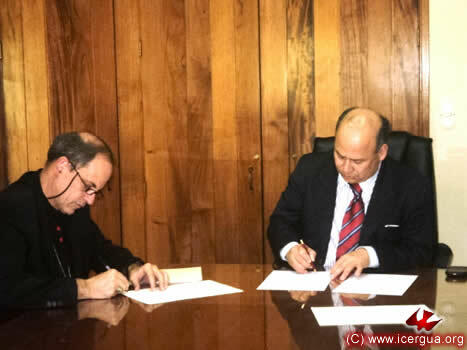 Left: Dr. Reyes and Monsignor Aguirre signing the agreement. The proceeding ended with a ceremonial toast. In the photograph: Seminarian Dámaso Mateo, Secretary of the School, Father Juan Moisés, our bishop, Dr. Reyes, Lic. García and Lic. 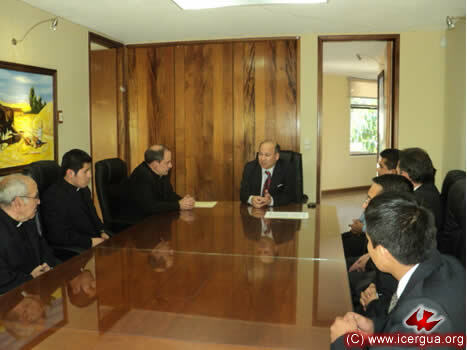 Federico Aguirre, the bishop’s brother and our channel of communication with the University. On Friday afternoon, February 4, Monsignor Eduardo presided at the Eucharist with the Pentecostés Community in Santiago Atitlán. On the occasion a number of children, well prepared by the catechists, made their solemn communion. In addition two new families requested formal admittance into the community. 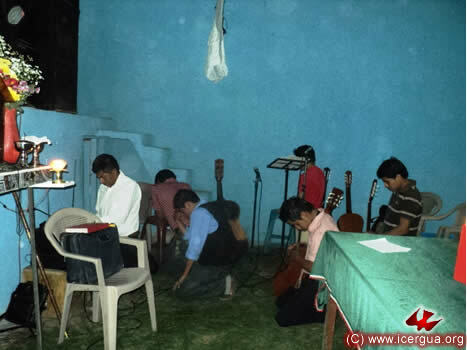 Above: Members of the music ministry at prayer before the celebration, preparing themselves spiritually for the ministry they will have during the Eucharist. Right: The bishop instructing the children about the commitments they will have after receiving their solemn communion. 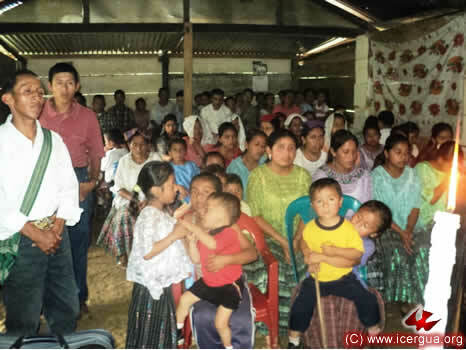 On Saturday morning, February 5, the bishop visited the Huicá Community in the municipality of La Libertad, Huehuetenango. A child was initiated into Christian life and two children received their solemn communion. Above: The faithful who participated in the Reconciliation praying for the outpouring of the Holy Spirit after they confessed their sins. Right: The People of God listening to the bishop’s homily. 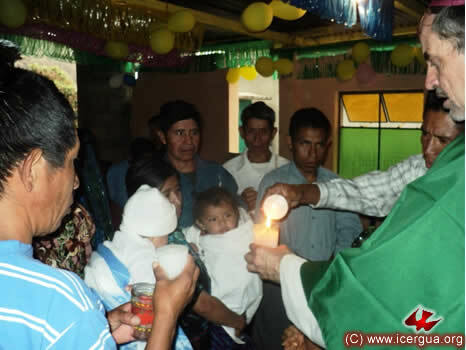 On Saturday afternoon, February 5, the bishop celebrated the Eucharist and the Christian Initiation of several children in the Santo Domingo de las Flores Community, La Libertad, Huehuetenango. This community is growing quickly, as indicated by the new construction shown in the photograph at left. 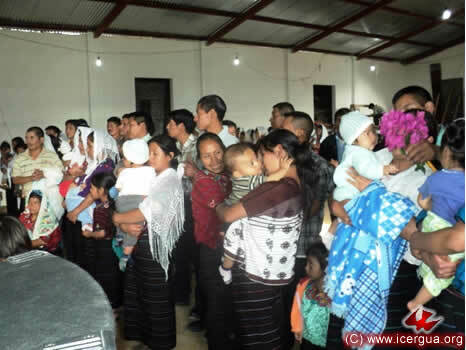 In face of the inability for the faithful to gather in one place and with the blessing of a good coffee harvest and good prices for it, the community, full of faith, began the building that will be three times larger than the present church. 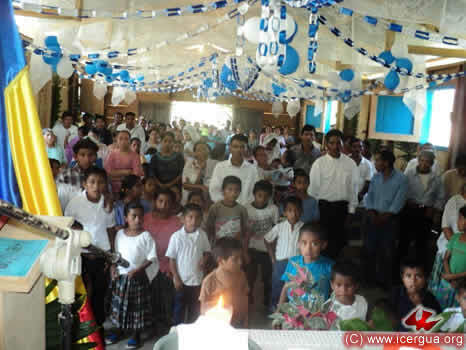 Five children were initiated into Christian life. 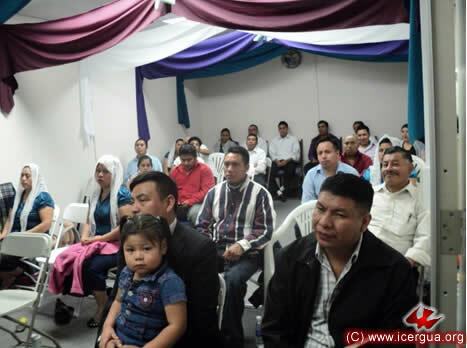 In the photograph, the bishop is instructing the parents and sponsors concerning the commitment that they are accepting and the lifestyle that as result they should have. 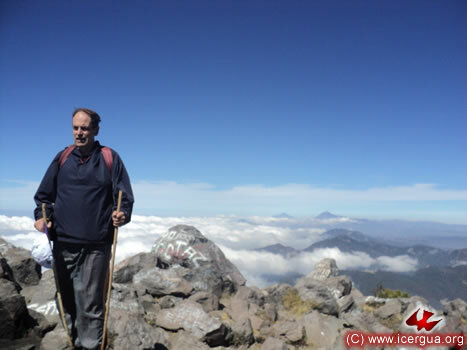 On Sunday, February six, the bishop made a pilgrimage to the peak of the Santa María Volcano in the Department of Quetzaltenango. 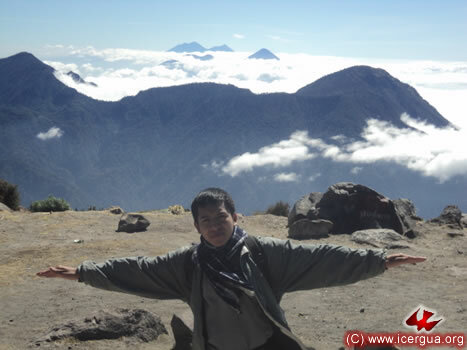 The climate and the panoramic view were unsurpassable. In the photograph at left: the bishop at the end of the climb. In the background are the Tajumulco and Tacaná Volcanoes. One of the special moments during the pilgrimage was the celebration of the Eucharist, praying especially that our church may have full communion with those who have maintained unaltered faith and full apostolic continuity from the beginning of Christianity. Right: Seminarian José Alfredo Hernández, who also participated in the pilgrimage. In the back are the Zunil and Pecul (or St. Thomas) Volcanoes, and behind them the San Pedro, Tolimán and Atitlán Volcanoes, and in the far distance the Fuego and Acatenango Volcanoes. 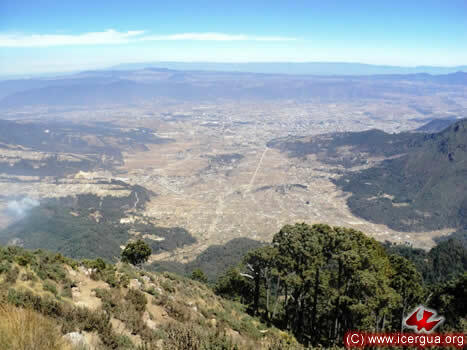 Left: A panoramic view of Los Llanos del Pinal and the whole valley of Quetzaltenango from the summit of Santa María. In the far background are the Cuchumatanes. To continue the ecumenical dialogues that may take us to full canonical communion, our bishop was invited to participate in a series of high-level meetings in Washington D.C., USA, on Wednesday, February 9. They continued the dialogues begun in New York in early December, which were reported in the December News. Although there is complete agreement on doctrine, liturgy and church organization, there are some contextual matters that have to be dealt with before the dialogues can culminate.The path is not manmade, for it is the path of responding to the will of Christ to achieve unity, so that “all may be one” as the Father and Son are one in the Holy Spirit; and because that is so we are called to put our trust in prayer. We ask all members of the church, our friends, those who read our news, to include among their special petitions the prayer that the Lord may lead us, in accord with his will, to full ecclesial communion. 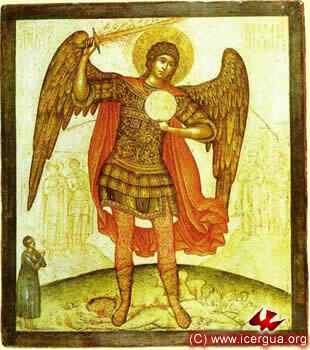 Our faith assures us that spiritual unity can come only from the work of the Holy Spirit, and that doctrinal, liturgical and organizational union can come only by returning to the origins of our faith, which are the worship, life and church organization testified in Holy Scripture, the Apostolic Tradition, and the teaching of the Church Fathers and which is the faith and organization that the undivided church professed and lived. We feel prepared to accept these elements completely. All that remains is to deal with the human obstacles so that all this may come in its fullness. 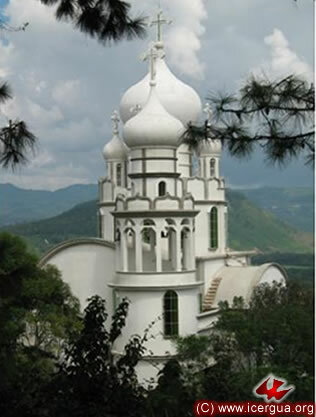 On Friday, February 11, our bishop was invited to visit the Orthodox Monastery Lavra Mambré in Amatitlán, Guatemala. The purpose was to continue the ecumenical dialogues with some distinguished guests who were visiting the monastery. The dialogue unfolded in an atmosphere of deep spirituality. One of its outstanding aspects was the confirmation that the road that our church began to travel years ago, leading toward a rediscovery of the original wholeness of the early church’s faith, worship and church organization, is now taking us nearer and nearer to those churches that have uninterruptedly kept visible the one, holy, catholic and apostolic church and have professed without any deviation the faith of the one undivided, indivisible church. On Saturday, February 12, our bishop visited the communities that comprise the San Miguel Arcángel Parish in Los Angeles, California. The first community to be visited was the one at Jefferson and Hill, where the parish has its seat. This community has undergone difficulties recently, for a third of the community has decided to form a new community. There are discussions about the new community being part of the parish, but with its own administration and organization. The faithful that are in the community regard the challenge as a call from the Lord to commit themselves with greater radicality and to try to rediscover in depth the original gift so that the evangelism they are doing may be effective. Above: The ministers that were to serve in the Eucharistic celebration around the bishop, just before the entrance procession began. Right: Some of the members of the choir singing the entrance hymn while the bishop and the ministers make their reverential bow at the altar. 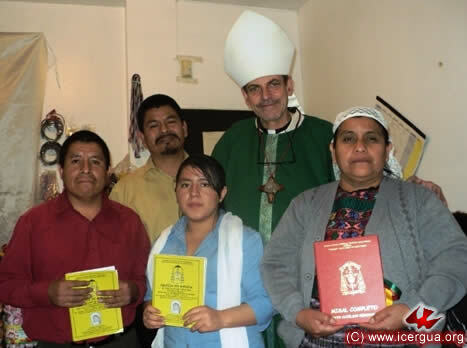 On Saturday evening, February 12, the bishop visited the Pacto Divino Community. Several months ago, as the result of various circumstances, the music ministry broke down. 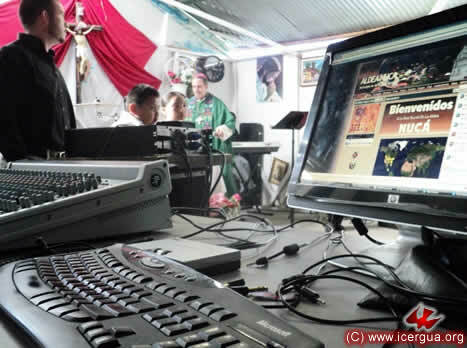 An effort made by all the faithful has changed that, and now there is a well organized music ministry whose musical abilities are increasing steadily. At left are the members of the music ministry playing the processional hymn for the Mass. 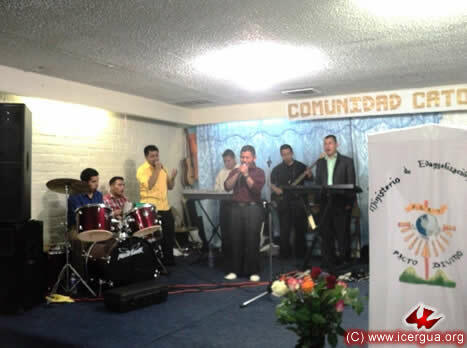 The faithful of the recently begun “Una Voz de Restauración” Community, also located in the center of Los Angeles, observed a midnight vigil. The community has a hundred members and is fired with enthusiasm in responding to the call that the Lord has given them. The bishop began by sharing a reflection on the sacramental dimension of the church and of the importance of the fact that soon they will have access to all the sacraments. Finally, he prayed over some of the faithful present, asking that the Holy Spirit might illumine them and lead them to respond generously to the special mission that Lord has entrusted to them. Above: Monsignor Eduardo praying for the faithful who had requested a special blessing. Right: The faithful listening to the bishop’s reflections on the sacramentality of the church. From 9:00 on Sunday morning, February 13, to 1:30 pm, ESTYMLA instruction took place. The session was divided into two parts. In the first various challenges that the community is facing today were analyzed, and various alternatives were suggested for responding positively to them. 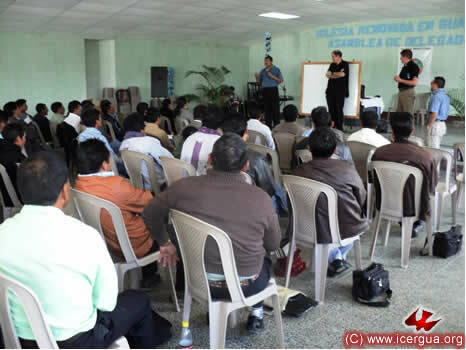 The second part was a broad-ranging reflection on the characteristics of our mission, which had been previously shared with the various Deaneries in Guatemala. Right: Some of the participants at the school, along with the bishop, during the break. During the afternoon, in the house of prayer that is located in the back part of the home of Lorenzo and Teresa Francisco, the Eucharist was celebrated with the bishop presiding. The Francisco couple asked that thanks be given to the Lord for the all the blessings received and asked for the continuation of the divine blessing. 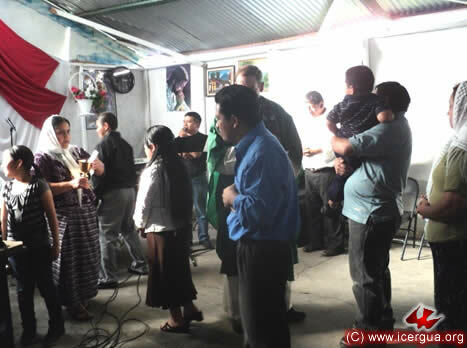 In addition, there was prayer for the recently established Committee to the support the stereo radio station, Nueva Vida in Nucá, Barillas, Guatemala. 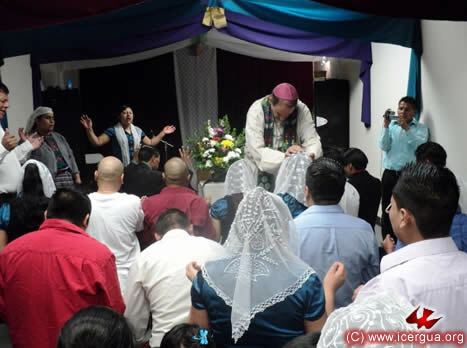 In this way, the faithful of Los Angeles can maintain unity and communion with the faithful in Nucá. Above: View of the control center from which the Eucharist was transmitted. 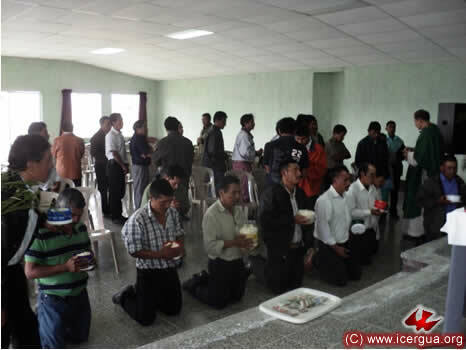 Right: The faithful coming forward to receive communion. On February 15, our seminary in San Lucas had the joy of hosting the Bishop Elect of Chicago of the Orthodox Church of America. Bishop Matías had been visiting the Lavra Mambré Monastery in Amatitlán, and took advantage of his time in Guatemala to visit us also. For us, his presence was a great joy and blessing. Our bishop greeted him and gave him a tour of all the Seminary’s facilities. FEBRUARY 15. EUCHARIST IN THE “NUESTRA SEÑORA DE LA PRECIOSÍSIMA SANGRE” HOME. In the afternoon of February 15, Monsignor Eduardo celebrated Eucharist in the Chapel of the residence that our church has in the Finca María Auxiliadora, San Raymundo. The young women and the members of the Religious order that comprise the Home, under the direction of Mary Faye Hellman, attended. The celebration coincided with the beginning of the new lectionary year and with the visit of one of Sister Mary Faye’s coordinators. At present there are twenty-three young women who are being educating at the Home. All of them come from indigenous communities and their primary objective is to acquire an academic and spiritual education that will help them to be effective agents in their communities and in society in general. Above: The sisters and the young women preparing for the Eucharistic celebration. 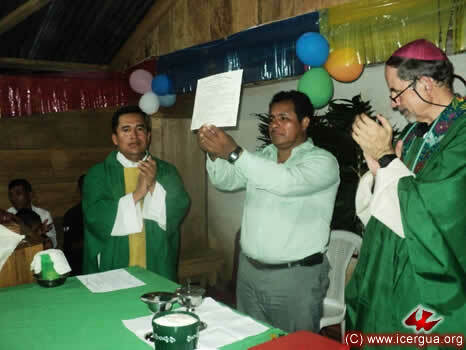 On Friday, February 18, our bishop celebrated Eucharist with the Tzununá Community on the shores of Lake Atitlán, in the municipality of Santa Cruz La Laguna, Sololá. At present, the faithful are organizing the construction of a church that will be much larger than the one they now use. They are trying in this way to advance a more committed evangelism in the community. 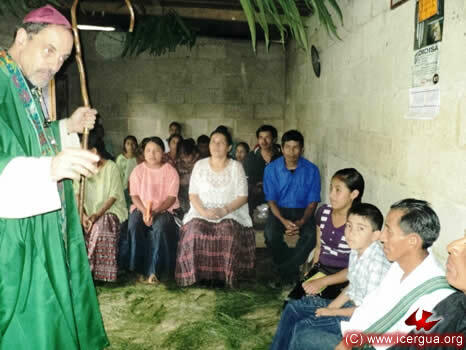 Late in the afternoon on the same day, the bishop celebrated Eucharist in the Jaibalito Community, also on the banks of Lake Atitlán. With this celebration, the faithful began the observance of the anniversary of the arrival of the Most Holy Sacrament at their house of prayer. The festivities lasted the entire weekend. 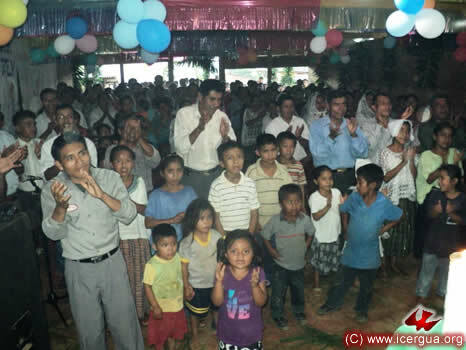 After going through a period of some difficulties, the community has now begun to experience growth and is very enthusiastic about carrying out its evangelizing mission. 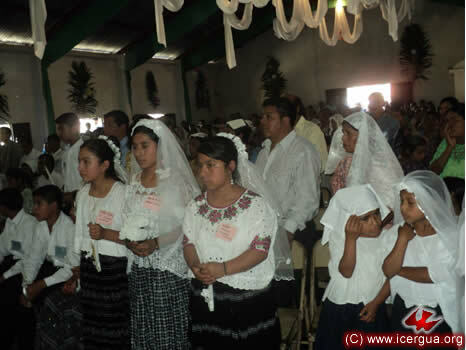 During the Eucharistic celebration the Christian Initiation of several children was also celebrated. Right: After the rite, the candles were lit, signifying that the light of Christ has been ignited in each of those initiated into the faith, and that now the counterpart to that light is their growth in faith, so that they may be the light of the world. 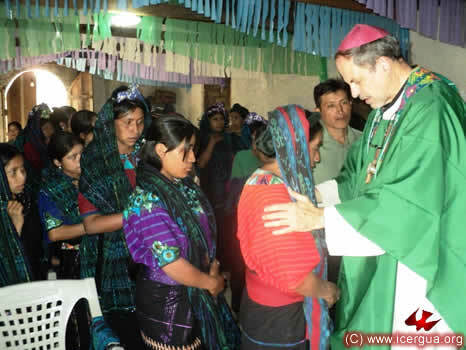 On the morning of February 19, our bishop presided at the Quarterly Assembly of the Deanery of South Huehuetenango. 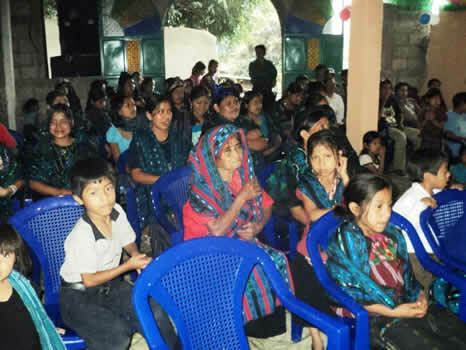 One hundred fifty faithful were present, who serve in the municipalities neighboring the departmental capital. Some concerns were shared, the growth that the community is experiencing was reported, and the sense in which each of our communities should clearly reflect the first Christian communities, as described in Acts 2:42, was explained. After the representatives of the various pastoral centers gave their report, the two presbyters and the seminarian who is doing his supervised pastoral work in the area gave their respective reports. 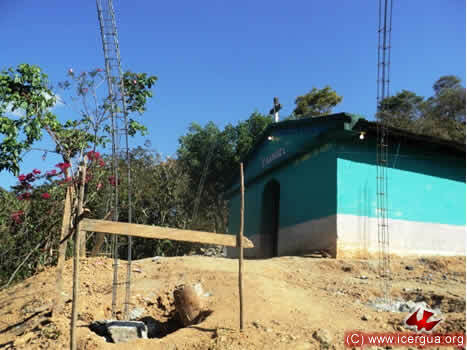 The presbyters are Father Pedro Martínez, who is working in the Cuilco area, and Father Marco Tulio Calderón, who is working in the Chiantla area. 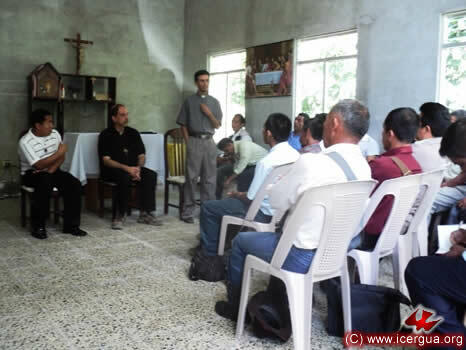 The seminarian is Yaider Jiménez, who is working in the San Pedro Necta area. The other areas are under the direct care of the bishop. The Assembly closed with the Eucharistic celebration, during which some Communion Ministers were installed. They had been previously elected by their communities and trained by those responsible. In addition the sacred host was provided for those faithful for whom the presence of presbyters for Eucharistic celebrations is infrequent. 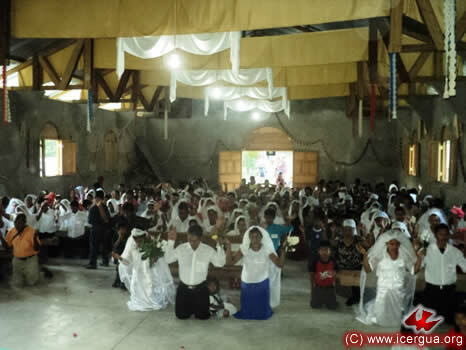 In the afternoon Monsignor Eduardo celebrated Eucharist in the Quiejolá Community, San Sebastián H. The bishop was astonished when he saw the beautiful church that the faithful are building. A few months ago, all they had was a small adobe church. Now they have finished building the façade, interior walls and roof of a beautiful, spacious church. It is a sign of their commitment to carry out faithfully the mission that the Lord has entrusted to us. During the celebration, Christian Initiation was administered to several children. Some young people were also confirmed and two couples celebrated marriage. 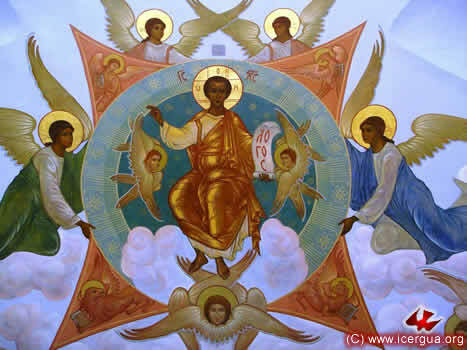 Above: Those who have confessed their sin coming forward to receive absolution. Left: Some of the children who are ready to be initiated into the faith. 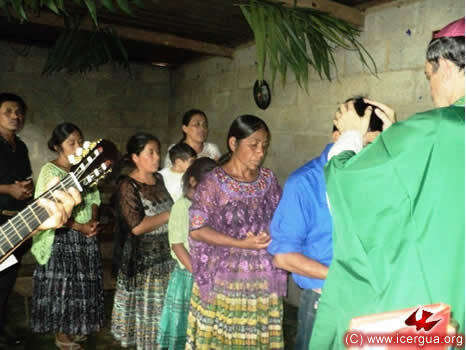 On Sunday morning, February 20, the bishop celebrated the Eucharist and administered the sacrament of Confirmation to a group of young people in the Community of San Nicolás, Chiantla. The faithful were appropriately prepared, and the ceremony was characterized by the harmony and active participation of all the faithful. Above: The faithful after confessing their sins are coming forward to receive absolution from the hands of our bishop. Right: The sponsors of the young people who had been confirmed in chrismal anointing are praying over them at the end of the sacramental rite. 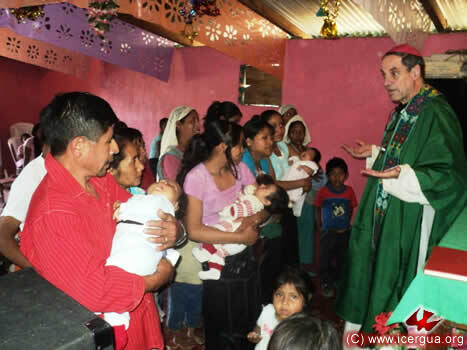 On the afternoon of February 20, Monsignor Eduardo visited the Ixnul Community in San Pedro Necta. 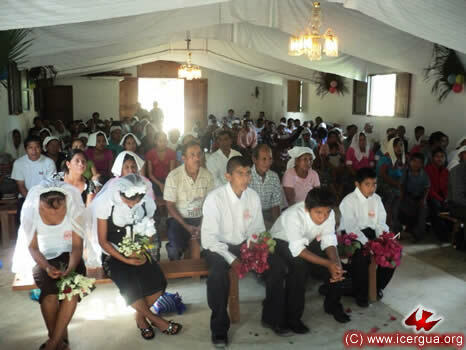 Two couples contracted matrimony and a large number of children were initiated into Christian Faith. The faithful of the San Pedro Necta area are now preparing a better organization since now they have the permanent presence of a seminarian. They hope that upon being ordained a presbyter he will remain permanently to work with them. Above: Invoking the Holy Spirit, praying for the forgiveness of sins, after the faithful had each made a personal confession. 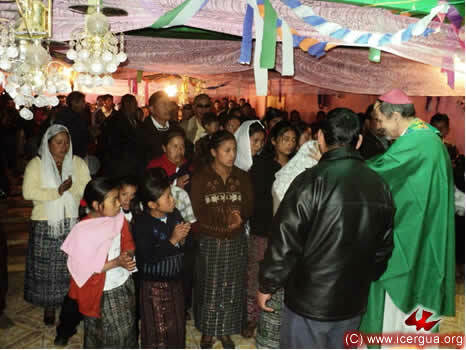 Right: Parents and sponsors praying over the children who a few minutes before were initiated into the Christian Life through the administration of the sacraments of baptism and chrism. 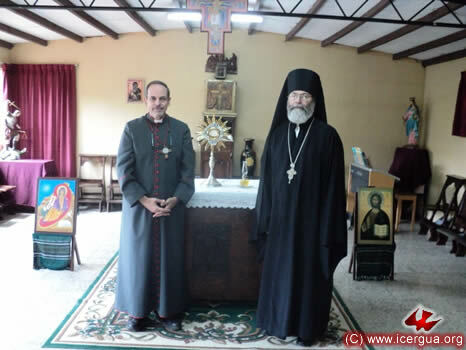 On Monday and Tuesday, February 21 and 22, our seminary was blessed with the visit of Father Iván, deacon of the Russian Orthodox Church outside Russia, who made an official visit of rapprochement. During the meditation period on the morning of February 22, Father Iván addressed the seminarians and exhorted them to observe the holy period of Lent with devotion and faithfulness. 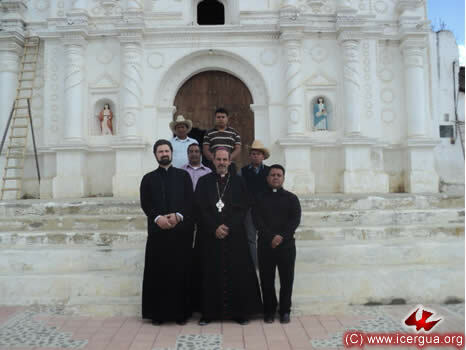 At midday on February 22, Father Iván, accompanied by our bishop, visited the Cathedral of San Juan Bautista. 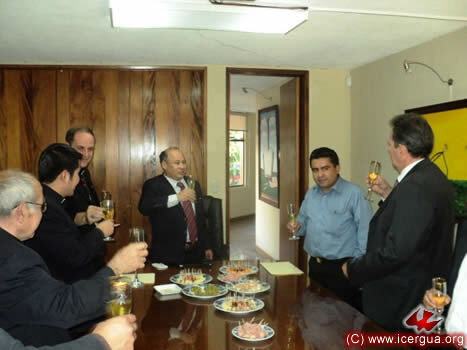 They were received by Father Rigoberto Upú, parish presbyter and Vicar General of ICERGUA, and some of the directors of the Association (the entity legally responsible for the cathedral). All were amazed by the beauty of the new Plaza of San Juan, which was to be inaugurated a few days after the visit. On February 24. 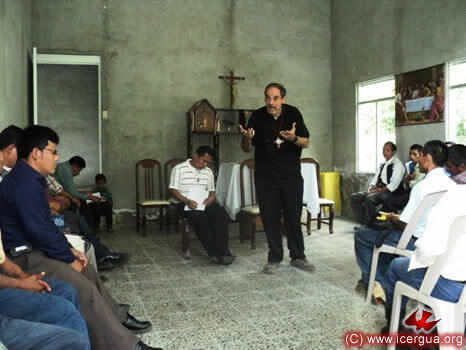 Monsignor Eduardo began his tour through the north of the country with the meeting of the Deanery of Cobán. Many faithful were present. Each representative of a pastoral center reported on the work going on there. 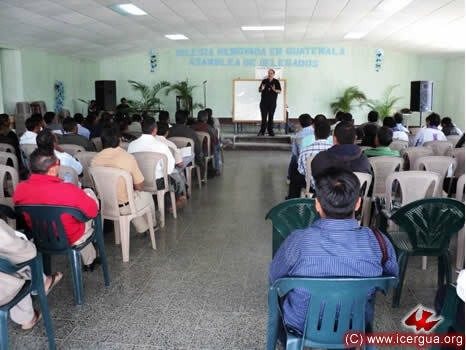 At the end, before the bishop began a report on the general state of the church and the anticipated instruction, the two presbyters who were working in the area—Fathers José Ángel Núñez and Fredy González—gave a detailed report on the pastoral zones. In the photograph at left: Father José Ángel giving his report. In the deanery, the bishop responded to various concerns the faithful had and gave instruction on the theme of the characteristics of a community. Of special interest was the question of “holding everything in common” in the early Christian communities. For us, this means holding in common all the gifts that have been received, and as result when someone goes on any kind of mission that person should count on the support of the community to which he or she belongs. 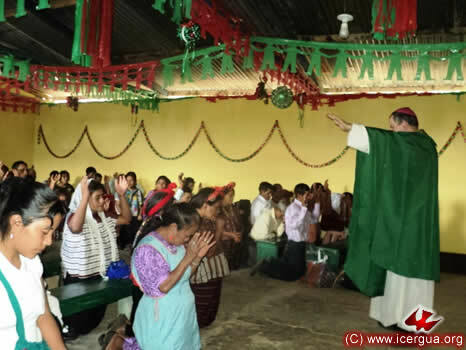 In the afternoon the bishop made his first pastoral visit to the San José Sahijá Community, located in the municipality of Cobán, but adjoined to Playa Grande, Ixcán, Quiché. The trip was long, and the walk from the place where the car was parked to where the community is located took forty minutes. The effort was well worth it. The faithful had prepared the visit with great joy. The number of participants was great, and the celebration unfolded in the best of ways. Above: The entrance procession in process of getting organized. 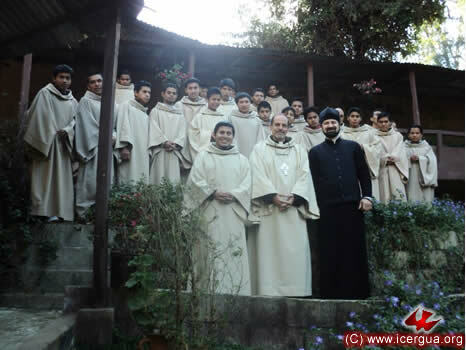 In the photograph are the bishop, Father José Ángel and brother Rolando. Right: The celebration. 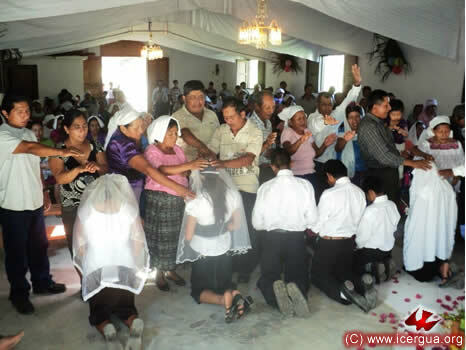 The faithful had prepared the celebration of several weddings and the administration of the sacrament of confirmation to many of the faithful. 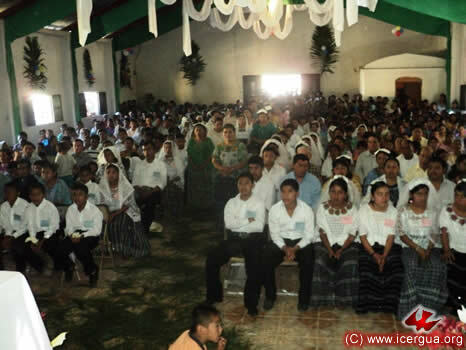 On Friday, February 25, in San Fernando, Sayajché, the meeting of the Petén Deanery took place. 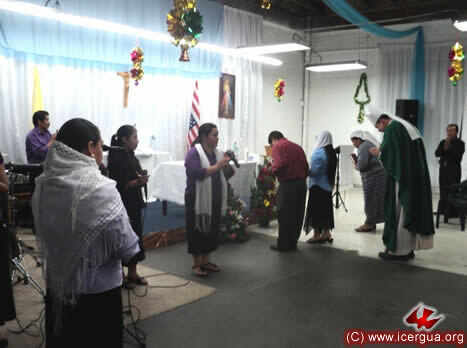 Many faithful from the parishes that were to be created that day were present: San Fernando y Chisec, as well as delegates from Raxujá and La Libertad. The atmosphere was especially festive, for as soon as the deanery meeting ended, the Mass in which the new parishes were created began. 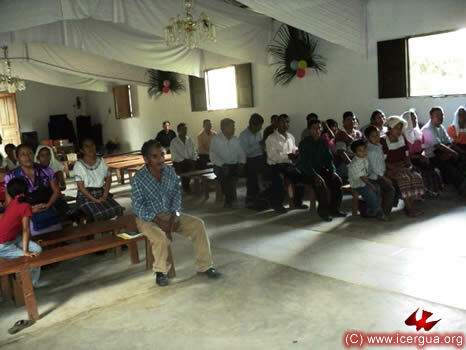 The new parish of Santísima Trinidad, Sayajché, Petén, consists of eleven communities and is centered in San Fernando. 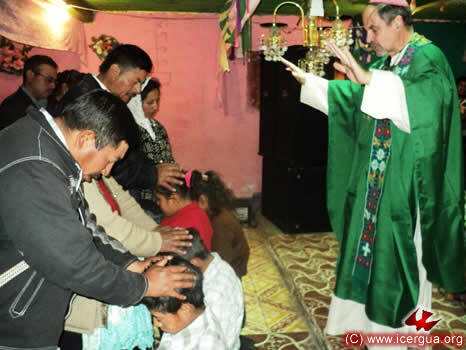 The communities have grown very much recently, and the faithful are convinced that now, having become a parish, they will be even better able to fulfill the mission entrusted to them. 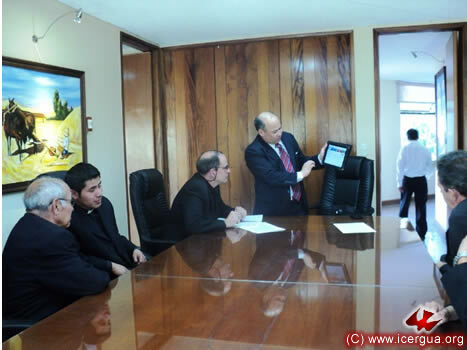 After reading the Decree, the bishop delivered it to the President of the Pastoral Council. He also delivered the sacrament registers to the Council’s secretary. Left: The moment when those responsible receive these signs that the parish has been created. 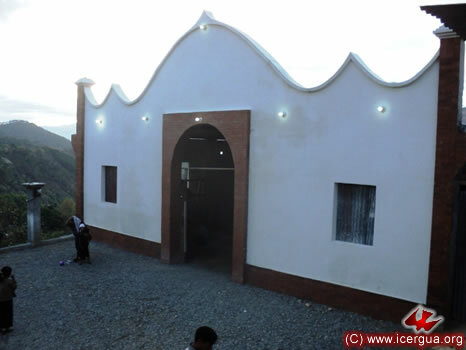 At dusk on February 25, the celebration was in the city of Chisec, Alta Verapaz, for the creation of the “Cristo Rey” Parish. At present, the parish is comprised of thirteen communities and there are several more in the process of joining. In fact, since the day on which the decree was signed creating the parish and setting the date of its promulgation, a new community has already been added. The community’s joy was obvious, for being a parish gives them a clear ecclesial identity and allows them to move forward in their evangelizing work. 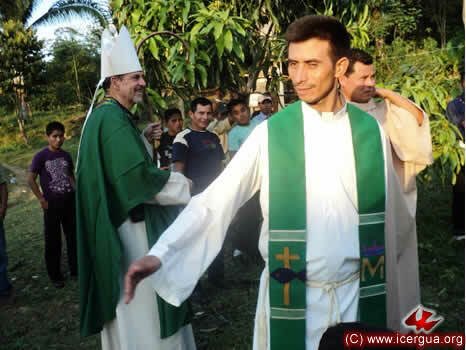 Father Fredy González is responsible for the pastoral work in the new parish. Right: The bishop reading the decree creating the parish. The President of the Pastoral Council is brother Alfredo. From the moment he accepted the charge to work for the formation of the parish, he has exerted himself tirelessly. Now he, along with the other members of the Council and those who serve in the all the communities have accepted the commitment to work with renewed enthusiasm to assure that the new parish will carry out all the implications of the mission entrusted to it. On the morning of February 26, the bishop traveled to Pueblo Nuevo in the northwest part of Ixcán. There the quarterly meeting of the Deanery took place. Representatives of all the communities were present. 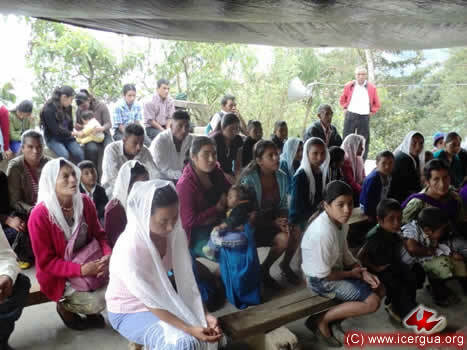 In addition a new community was presented which has just joined: El Edén, which is located in the center of Ixcán and has seventy-four adult members and three hundred young people and children. One of the topics at the meeting was the purchase of land on which the Mission Center will be built. It will also be the Deanery See. A suitable lot has been found in Veracruz, and it is hoped that soon the material means for acquiring it and then building the Deanery See will be available. 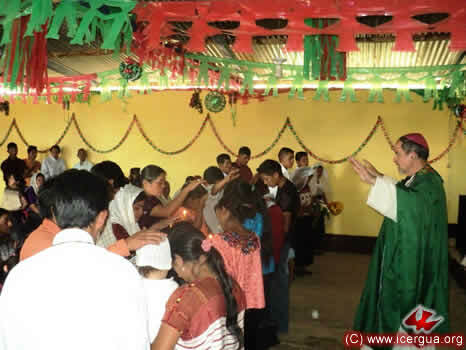 In the afternoon the bishop presided at the Eucharistic celebration in the Pueblo Nuevo Community. A large number of young people received the sacrament of confirmation. Right: At the end of the sacramental rite, parents and sponsors are praying over their children, asking the Lord that the gift they have received may produce abundant fruit in their lives. In late afternoon Monsignor Eduardo visited the Victoria 20 de Enero Community. 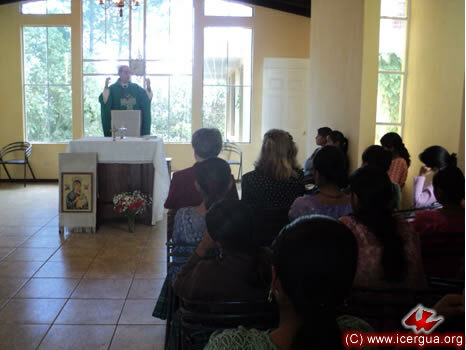 The bishop had visited this community the past year, and the faithful were meeting in a small wooden house of prayer. 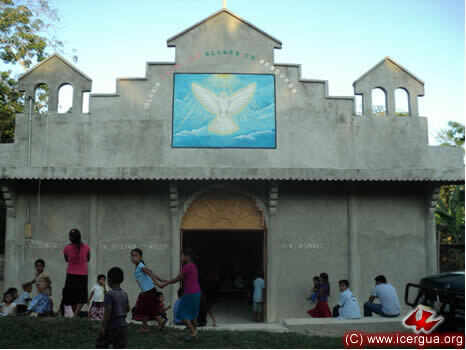 Now, to his surprise, they have built most beautiful and large church, for the community has grown remarkably. During the celebration the sacrament of confirmation was administered to fifty young people and adults. In addition several weddings were celebrated. 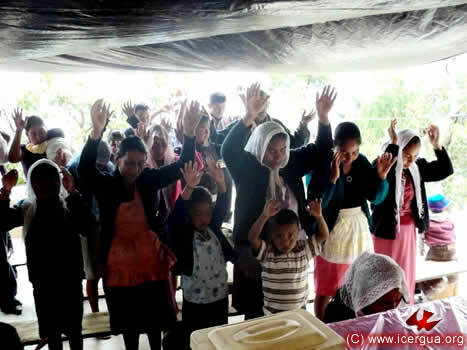 The community is enjoying a time of special blessing, and the faithful are determined to persevere in carrying the mission of evangelism that they have received from the Lord. Above: Prayer over those who are about to be confirmed. Left: Some of the couples contracting matrimony. FEBRUARY 27. 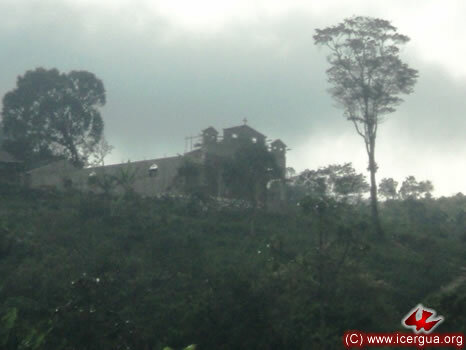 CREATION OF THE “JESÚS, EL BUEN PASTOR” PARISH, VISTA HERMOSA, SAN PEDRO CARCHÁ. 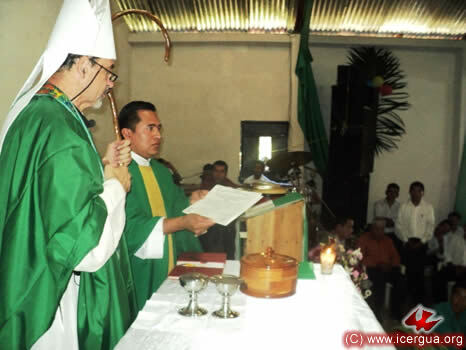 On Sunday morning, February 27, Monsignor Eduardo arrived at Vista Hermosa Cojaj, San Pedro Carchá, for the creation of the “Jesús, el Buen Pastor” Parish. 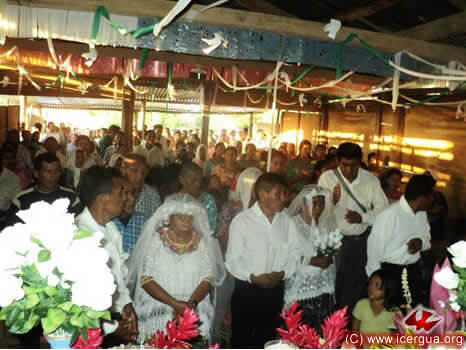 In 2005 the Cojaj Community was the first to make a covenant with our church. From its pastoral center, three other centers have emerged over the course of the years. The original church is still growing, and now has thirteen communities that have been joined to form this parish. 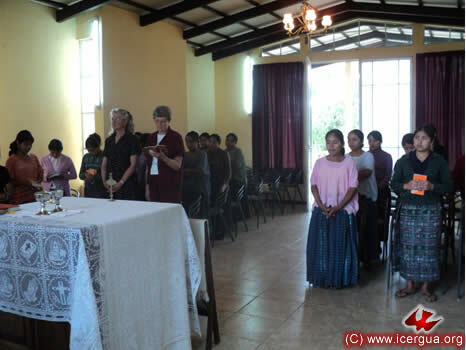 Taking advantage of the bishop’s visit and emphasizing the commitment that is implied in being elevated to the status of a parish, the community organizers prepared a group of forty-five faithful to receive the sacrament of confirmation. During the celebration, those who were to be confirmed as well as all the other participants promised to continue working with enthusiasm so that the power of the Gospel may reach far and wide. 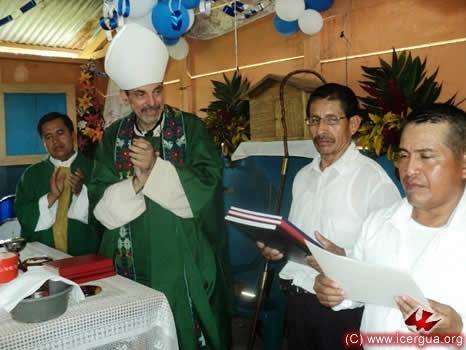 At midday, the bishop visited for the first time the new community in the center of Cojaj, San Pedro Carchá. The leaders are brothers Antonio and Perfecto. 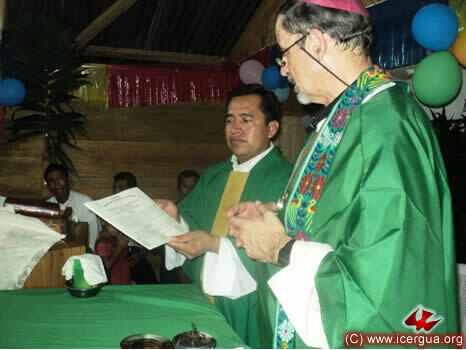 Both were involved in the process of covenanting with ICERGUA in 2005. With the passing of time, they have felt called to evangelize the area where they live and some time ago started a new community there. 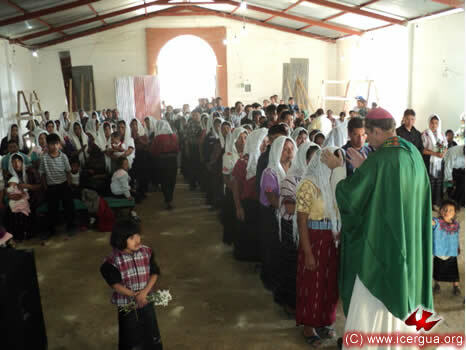 Pastorally they are joined to the Chitania Center, which is in process of becoming a parish. Above: Participants coming forward to receive absolution of sins after making their confessions. Right: The homily, in which the bishop urged those present to commit themselves to manifesting their faith in concrete works, for in this way the foundation for their whole life would be the rock of Christ. 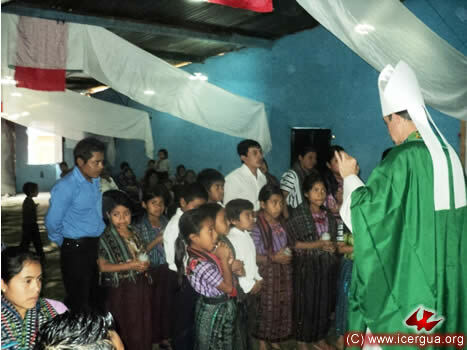 In the afternoon of February 27, the bishop went to the Santo Tomás Purahú Community, Cobán, Alta Verpaz. The community is meeting in a temporary house of prayer. On the same site where the house of prayer is located, they are already building a most beautiful church. Right: The beautiful church that the faithful of Santo Tomás are building. The walls are finished. What is left to do are the roof and interior work. The good cardamom harvest this year and the favorable prices for it have given them the means to bring about this project, for which they had been hoping for many years.